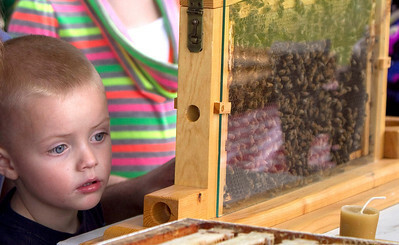 John Konstantaras/for the Northwest Herald Barrett Buchanan, 3 from McHenry, watches Harvard beekeeper Doug Hawthorne's Italian honey bees at the “A Day on the Farm” program at the Colonel Palmer House. The event was sponsored by theCrystal Lake Park District and the Crystal Lake Historical Society. 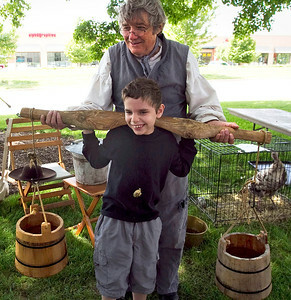 John Konstantaras/for the Northwest Herald Bob Paine of Crystal Lake helps Dominick Olandese, 10 of Woodstock, as he tries on a harness to carry water buckets at the “A Day on the Farm" event Sunday. John Konstantaras/for the Northwest Herald Ten-month-old Griffin Gimm, Crystal Lake, ges a little help from his grandfather at a butter churning exhibit at the Crystal Lake Park District and the Crystal Lake Historical Society’s “A Day on the Farm” at the Colonel Palmer House on Terra Cotta Ave Sunday June 3, 2012. 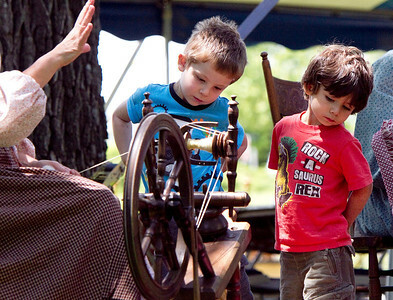 John Konstantaras/for the Northwest Herald Rylind, 4, (left) and Jaxson, 3, Chess from Lake in the Hills learn about 19th century life as they watch a yarn spinning exhibit at the “A Day on the Farm” program at the Colonel Palmer House. The Crystal Lake Park District and the Crystal Lake Historical Society sponsored the event that focused on the contributions of birds and honeybees to pioneer farm life. The program held at the Colonel Palmer House also featured displays detailing 19th century life in Crystal Lake. Ten-month-old Griffin Gimm, Crystal Lake, ges a little help from his grandfather at a butter churning exhibit at the Crystal Lake Park District and the Crystal Lake Historical Society’s “A Day on the Farm” at the Colonel Palmer House on Terra Cotta Ave Sunday June 3, 2012.